Carnevale in Venice can be bewildering. Here’s the best things to do and see. Crowds in St Mark's Square on the opening day of Carnevale. Carnevale in Venice is one of the highlights of tourism in Italy and the city can be chaotic. If you’re going to Carnevale in Venice here’s our guide to the best way to see it - in five easy steps. How to enjoy Carnevale in Venice #1 : don’t expect Rio! Rio's Carnival is fun - but different. They may have a common history and a common theme of enjoying life before the sobmre days of Lent fasting kick in, but the Carnivals of Rio and Venice don’t bear much comparison. So what’s common to both? Colour. Music. Noise. Food and drink. People enjoying themselves. And tourists - lots and lots of tourists. And what’s different? Don’t expect Venice to have the same extravagant flamboyance as Rio. Rio is about excess - huge floats, massive costumes, mile-long processions within a formalised setting. Venice is about elegance and informality. It’s more staid than other Carnivals - even Italian Carnivals. No-one in Venice would dream of engaging in the excesses of Ivrea’s traditions of Mardi Gras or the circus performances of Rome's Carnival magic. You won’t find mile-long processions. You won’t find huge floats. You won’t find many fire-eaters or Samba dancers. Expect excess. Expect extravagance. Expect costumes and Italian masquerade masks, expect music, expect masked balls. But if you go to Venice expecting Rio, you’ll be disappointed. How to enjoy Carnevale in Venice #2 : be brave and wander! are worth getting lost in. This is one of the loveliest things to do in Venice at any time of year, but particularly during Carnevale. St Mark’s Square is the main place to see costumes and masks. But you’ll also find hoardes of tourists here and if you want to get close enough to photograph the most flamboyant costumes, you’ll have difficulty. Simple. Just wander. Don’t look at a map, with the possible exception of the little waterbus map. Don’t plan to go anywhere - just go. Carnevale happens all over the city, not just in the main squares and the most visited tourist centres. Because Carnevale in Venice is not, as in some places, a series of parades but a festival for the whole city and its different neighbourhoods, you’ll find people all over the city dressed in costume. 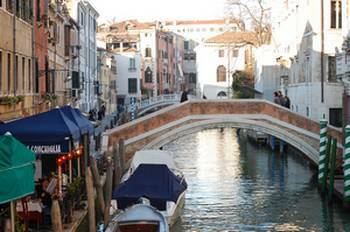 Walk across a quiet bridge near Accademia and round the corner will come an elegantly dressed and masked couple. Come to a quiet square in Dorsoduro and you’ll find a neighbourhood group presenting a costumed drama for the children. Happen upon the church of Santa Maria dei Miracoli and you’ll find some of the most elegant costumes as well as street musicians playing their hearts out. You’ll escape the crowds and you will always, always find something to surprise and delight you - and it’s so much better when you feel you’ve discovered something the hoardes in the square haven’t seen! How to enjoy Carnevale in Venice #3 : sit in a bar! Having said the best way to see Carnevale is to wander, there are some things which are so typical of Venice (Italy) tourism spectacles that you’ll probably want to make sure you see them. Most take place in St Mark’s Square. he most spectacular are on the first day : the ‘Festival of Brides’; the ‘Volo della Colombina’, when an 'Angel' or dove flies on a wire from the belltower over the heads of the crowd below; and on the last day when the ‘Grand Parade’ passes through the square. All those are worth seeing, but be prepared to be squashed in the crowds! Our tip about how to avoid that? 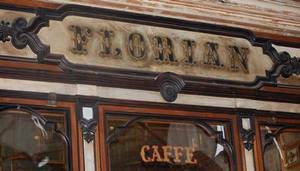 Get to the Caffè Florian early and sip a (very expensive, but worth it!) coffee while you watch. 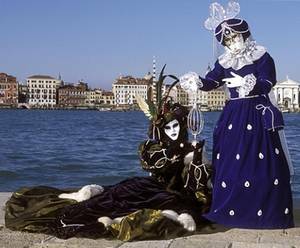 In the afternoon and evenings head for the bar of the Hotel Danieli where you’ll find masqueraders, some fun events such as classes on how to take part in traditional Venetian dances, and occasionally a public display of costumes. How to enjoy Carnevale in Venice #4 : dress up! The history of Italian masquerade masks at the Carnival is well known. If you’re there at Carnival time, you’ll see them everywhere - they're a major part of Venice (Italy) tourism. Even people going about their daily business will often dress up with a simple masquerade mask as a passing tribute to the customs of Carnevale. You’ll feel far more a part of it all than a tourist if you do the same. Don’t worry if you can’t afford one of the more extravagant costumes - you can buy Carnevale masks before you go or while you're there, and there are always make-up artists on the streets offering to add to your disguise. And then? 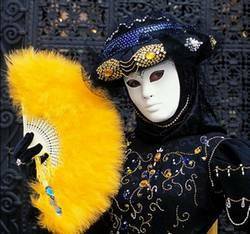 Going to a masquerade ball is one of the most popular things to do in Venice at Carnevale - but remember those events are not cheap, and they need to be booked well in advance. Or just join in the fun for free. Wander the streets. Have your photograph taken. Build yourself memories of a lifetime. Wave, smile, enjoy. This tip assumes that you will have a camera (or two!) with you when visiting this most photogenic of all Venice (Italy) tourism attractions. You won’t need ever to worry about any language barrier in Venice - the city is so used to visitors from non-Italian speaking countries that almost everyone who lives and works there is multi-lingual - at least in tourist-type information. Taking photographs is one of the best things to do in Venice at any time of year, but at Carnevale it’s a must-do. So make sure you take a good camera, and a huge memory card. But as importantly - remember not to leave your manners at home! Most of the people wearing very elaborate carnevale masks and costumes at Carnival time are very used to tourists wanting to photograph them. Even if you speak no Italian, most will respond with great patience and courtesy if you simply smile and wave the camera vaguely in their direction - they know how to pose and you will get some amazing shots. But be careful. Italian people expect a certain level of courtesy. Don’t push in front of other people for your picture. Don’t push your children in front of them. Don’t try to push them into some position you want them to be in - they will know where the best place for photos is. Do always ask. Do address masked people as “Signor (or Signora) Maschera” (pronounced mask-era’. Do wait for them to position themselves. Do thank them when you’ve finished. Do, simply, remember your manners. Save the date! Make sure you don't miss out on Carnevale - have a look at our calendar which will tell you when Mardi Gras is between now and 2020. Carnevale in Venice is always massively busy. If you’re thinking of a gondola ride you’d be well advised to book it in advance - otherwise you may be disappointed. If you feel a bit too nervous to walk around the city without a map, make sure you buy one before you arrive - they’re massively expensive in the city (like most things!). We review the best maps of Venice here.